John Kerry, “John Kerry,” Histories of the National Mall, accessed April 23, 2019, http://mallhistory.org/items/show/75. In 1971, Secretary of the State, Senator, and US Navy veteran John Kerry protested against the Vietnam War in front of the US Capitol when he returned from his tour of duty. As a member of the group Vietnam Veterans Against the War, he accused the US military of committing war crimes in Vietnam and testified before Congress in April 1971. After testifying, Kerry and hundreds of other activists called for an end to the conflict in Vietnam by throwing military ribbons, medals, and pieces of their uniforms on the steps of the US Capitol. Photograph via Wikimedia Commons. View original image. Kerry was born on December 11, 1943 at Fitzsimons Army Medical Center in Aurora, Colorado to Rosemary Forbes Kerry and Richard Kerry, a Foreign Service officer. He attended Yale University, then enlisted in the Naval Reserve and went to Officer Candidate School. He served 2 tours of duty in Vietnam, serving in combat as a Swift Boat skipper patrolling the rivers of the Mekong Delta, earning a Silver Star, a Bronze Star, and 3 Purple Hearts. Upon returning to the US, Kerry began to speak out against the Vietnam War. Testifying at the invitation of Chairman J. William Fulbright before the Senate Foreign Relations Committee, Kerry asked, "How do you ask a man to be the last man to die for a mistake?" His testimony and protest remains controversial. 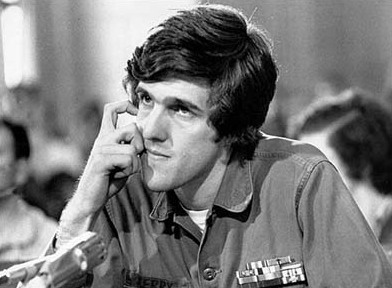 In 1972, Kerry began his political career and ran for a seat in the House of Representatives. He lost the election, and went to Boston College law school to become a prosecutor. By the 1980s, Kerry returned to politics and was elected as a Senator from Massachusetts. During his time in the Senate, he fought for veterans' benefits, including an extension of the G.I. Bill for Higher Education and improved treatment for post-traumatic stress disorder. In 2004, Kerry was a failed Democratic nominee for president, after which he returned to his Senate seat. In 2013, he was nominated and confirmed as the Secretary of State.